Last November, Republican travel agency owner Scott Milne shocked the political establishment by nearly defeating Democratic Gov. Peter Shumlin. Now Milne is considering an even tougher challenge: running against seven-term incumbent Sen. Patrick Leahy (D-Vt.), who has served in Congress since 1974. "A lot of people have said, 'Why don't you think about running for that seat?'" Milne said Monday. "It's something that's on the table for 2016, yeah." Milne fired an unusual shot across Leahy's bow earlier Monday in the form of an email to state reporters. In it, the Pomfret businessman criticized Leahy for holding a $5,000-per-person fundraiser last weekend in Vermont. 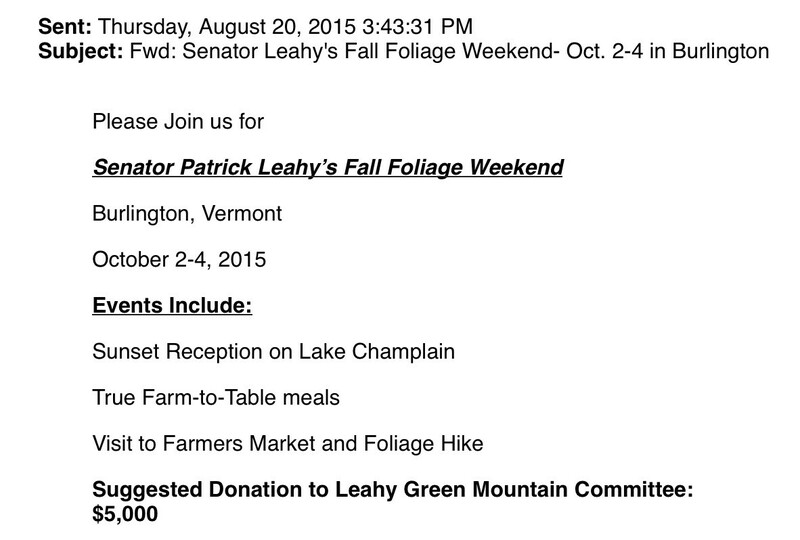 According to an invitation Seven Days had previously obtained, the fundraiser benefited Leahy's leadership political action committee, Green Mountain PAC, and featured a "sunset reception on Lake Champlain," "true farm-to-table meals" and a "visit to farmers market and foliage hike." "What's wrong with this picture?" Milne wrote about the event, calling Leahy "complicit in the growing influence of money in campaigns and the entire political system." Milne challenged the incumbent to spend just $100 on his 2016 reelection campaign. He cited the example of the late senator George Aiken, who, according to legend, spent just $17.09 on his 1968 campaign. “Senator Leahy could learn from Senator Aiken’s example," Milne wrote. "He could win his final campaign for the United States Senate by fundraising and spending like George Aiken. I challenge him to run a $100 campaign and to demand outside money stay out of Vermont in the 2016 United States Senate race." In a written statement, Leahy campaign manager Carolyn Dwyer brushed off the challenge. "Mr. Milne is pondering a run against Senator Leahy but would first like Senator Leahy to promise he will limit his campaign spending to $100. That's a novel approach," Dwyer wrote. "If Mr. Milne gets into the race we will be happy to discuss this or any other ideas he brings to the table." How serious Milne is about challenging Leahy isn't quite clear. He said Monday that he's also considering running for the Vermont legislature and for lieutenant governor. Milne said he has not spoken with the National Republican Senatorial Committee or any other major GOP organization about the possibility. "I haven't talked to the big muckety-mucks about it or anything like that," he said. "But that's the fun thing about Vermont: You can come out of nowhere, like I did a year and a half ago, and potentially become the Republican nominee, if I choose to do that." Indeed, Milne was largely unknown in June 2014 when he filed papers to run for governor. Five months later, he fell just 2,434 votes short of Shumlin. Because neither candidate won 50 percent of the vote, the election was thrown to the legislature, which elected Shumlin. Asked Monday how he thought Leahy has performed in the Senate, Milne said he has a "lot of respect" for his potential opponent and "what he's accomplished in life." He declined to criticize the senator for anything other than his fundraising practices. 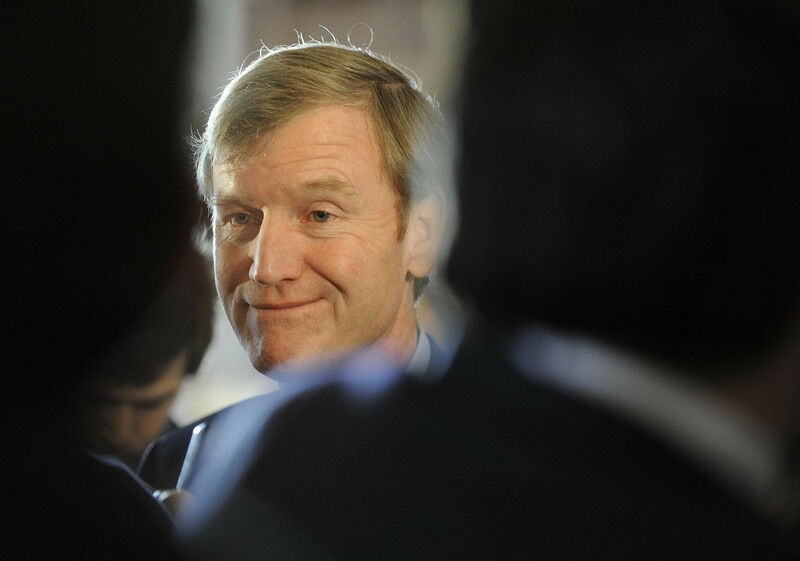 Milne also declined to commit to the terms of his own challenge and spend just $100 on his own campaign, should he choose to oppose Leahy. "I would clearly have to consider that," he said. "We'll wait and see what Pat Leahy's doing and what we think is going to be effective." Even if Leahy were inclined to accept Milne's challenge, he's already spent well more than $100 on his reelection. Since winning a seventh term in 2010, Leahy has doled out more than $1.5 million from his campaign account, according to a July filing with the Federal Election Committee. "We won't count that," Milne said. "We'll just count going forward."